International environmental agreements (IEAs) are considered an important way to increase the efficiency of emission abatement and climate change mitigation. This paper uses a game-theoretic model to investigate the effect of possible tipping events, which would bring catastrophic and irreversible damage to ecological systems and human societies, on individual countries’ emission decisions and on the scale of participation in IEAs that would maintain stability of the IEA. 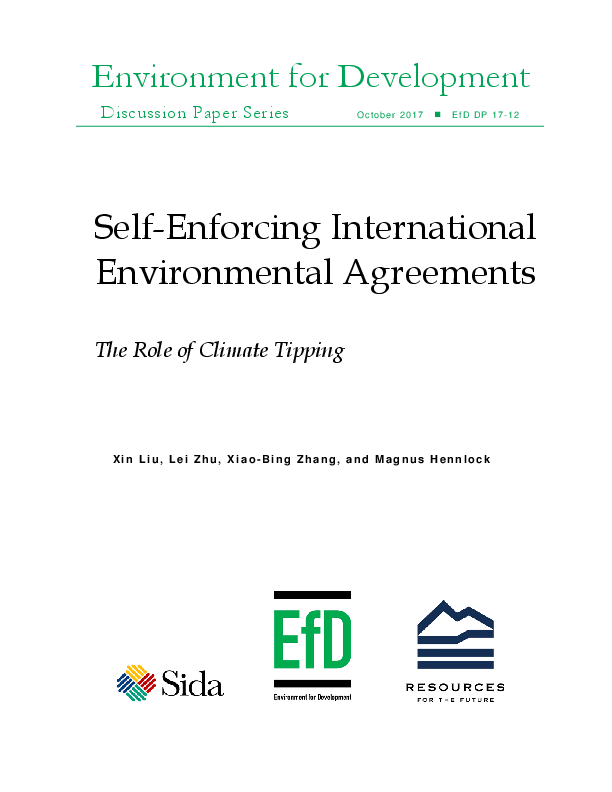 The results show that if the threshold of total emissions for triggering the tipping events is high, the possibility of climate tipping would have no effect on the stable number of participants in IEAs. However, if the threshold for tipping is low, whether the climate system would cross the tipping point depends on the magnitude of damage due to climate tipping. Moreover, the effect of possible tipping events would increase the size of a stable coalition if the signatories’ coalition is the first mover. Otherwise, in a Nash equilibrium, the possibility of tipping would decrease the scope of participation in IEAs if the tipping damage is high, while it would induce more countries to sign IEAs if the tipping damage is moderate.